A garage door is the biggest piece of moving equipment in your home. When a quality door is professionally installed, it will provide the homeowner with peace of mind and years of safe operation. Our large selection of garage door styles, finishes, construction options and materials, provides you with a variety of options to fit every need whether it be commercial or residential use. 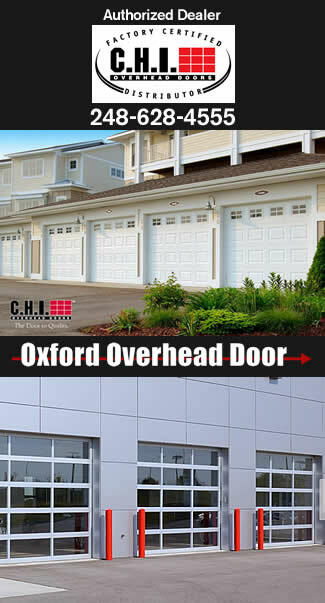 Oxford Overhead Door Sales Company is proud to be an Authorized Dealer for C.H.I. and Clopay overhead doors. Give us a call today for a FREE garage door estimate. Keep in mind that you are not just purchasing a door, you are also getting a company that stands behind its products and workmanship. Call Oxford Overhead Door Sales Company for residential and commercial garage door openers. We are an Authorized Dealer for LiftMaster and Micanan. When it comes to replacement parts, we have you covered. We can order parts from any manufacturer. If you need door sections, springs, weather seals, replacement transmitters or any other parts, we are happy to assist you with fast, friendly service. Many options to fit your overhead door needs.